Hi, I’m Mary, and I blog at Redo Mom. I love s’mores!! They are so incredibly yummy and I love summer BBQ’s because they mean s’mores! This is a really simple idea and recipe, but it is so good. I made these and I could not stop eating them. They taste divine and have a nice gooey marshmallow center. It’s just a simple spin on a old time favorite. Also, you can leave these on the skewers and put a clear plastic covering and some ribbon and you can give it as a gourmet treat! You have to give these a try. They are super simple, so the instructions are easy. Here is a mostly picture tutorial. First you lay out the bottom cracker, chocolate squares, marshmallows on a cookie sheet. Then you watch as they broil… don’t leave because it really doesn’t take very long. Just wait and watch until the get a little brown on top. While they are broiling, melt your dipping chocolate. 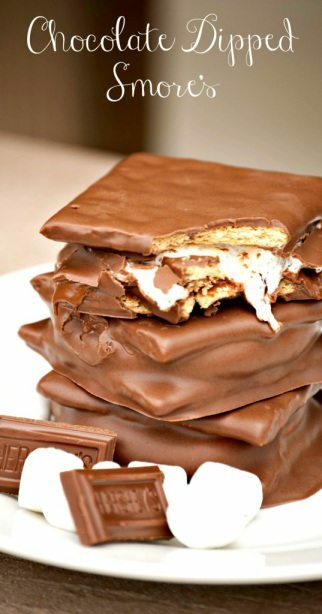 Pull your s’mores out of the oven and put a little chocolate on top of the marshmallow before putting your top cracker on, this just helps the cracker stick to your s’more. Then let them sit and harden for about 30 minutes. Then you stick a skewer in the side so that you can dip them. Lay them all out on some wax paper and let them sit while the chocolate hardens. You can then either pull out the sticks or eat them right on the stick. Don’t these seriously look yummy. I spread some Peanut Butter on mine and it was unbelievable. I have to take a second to thank Sarah for letting me share my s’mores recipe on her blog today. I met Sarah at a blogging conference and she is amazing!! I had such a great time getting to know her and her story. She is just fun to be around and extremely talented. I haven’t been blogging for super long, but she has made me feel welcome and has given me good advice.